My fiance and I are big time animal lovers - we volunteer almost all of our spare time to help animals, and I work at our local Humane Society. We knew that when we got married that animals would have to be involved. We reasoned that our wedding would provide a captive audience for causes that were important to us and would provide a wonderful opportunity to help animals. We also believed that if we were going to spend a good chunk of money (our budget was under $5K), that it might as well benefit someone else. We began our planning process by looking for an animal friendly ceremony and reception site - we found a great restaurant in downtown Indy off of the canal that allowed animals on their patio (we had plans to include our dog in the ceremony-more on that later). 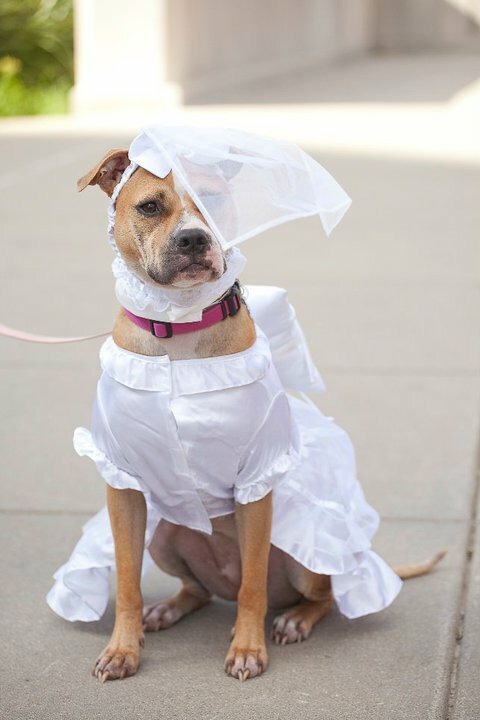 1) Our beloved pit bull, Angel, was in our wedding as the ring bearer. She was even dressed in a wedding dress and veil! Besides the fact that we love her TONS, we also wanted to include her because we wanted to show others how well behaved and wonderful pit bulls are. We help advocate for the breed and participate in events that promote spaying/neutering, rallies against dog-fighting, etc. She made a very lovely dog bride don't you think? 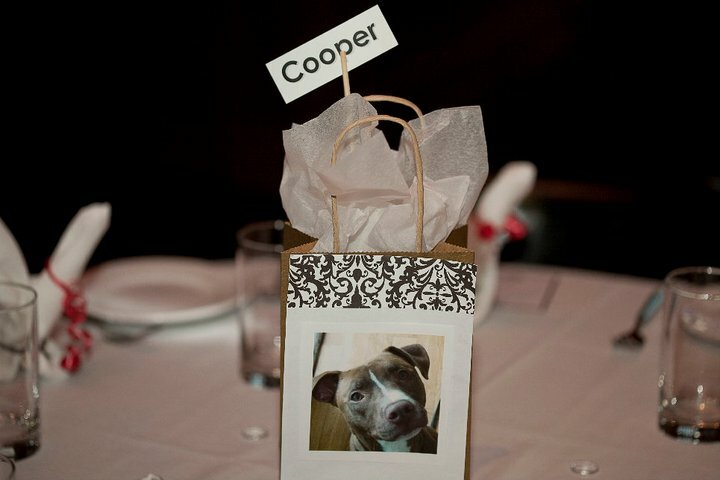 2) Our centerpieces featured adoptable animals' pictures and descriptions. We chose animals strategically based upon who was sitting at the table. My husband's grandparents have a rat terrier, and they are from Florida, so it was no surprise to them that they had a photo and description of an adoptable rat terrier from Florida at their table! Another friend loves Siamese cats, so of course, she had a Siamese cat's information. 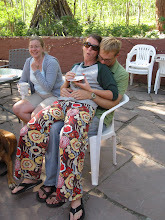 4) We served a vegan meal - my husband and I are vegetarian and did not want to include meat in our wedding because we felt it would go against our views (we oppose factory farming), so we opted for a really tasty lasagna dish that was appealing to meat eaters as well. Our cake was even vegan! 6) Instead of giving out wedding favors, we made a donation to the rabbit sanctuary and left a note for our guests explaining the gift. We even found a napkin fold in the shape of a rabbit for each table setting as a nod to our honeymoon. 7) In our picture slideshow, we included information about the different non-profits that we volunteer for. 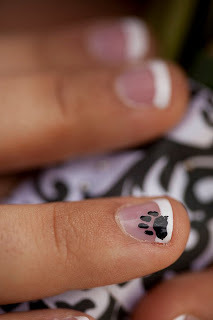 8) We also included some other cutsey details: I had a paw print painted on my fingernails, I wore a bracelet that featured a paw print and said "save a stray," and my husband and I made our own wedding rings in a jewelry making class that had paw prints on them. Incorporating a cause we valued was extremely rewarding to us, and we highly recommend it to others. Using your wedding as a way to help out another group of people (or animals in our case) is a wonderful way to help out your community and local non-profits that are on tight budgets. In addition, it is a great way to showcase your values and personality to family and friends. 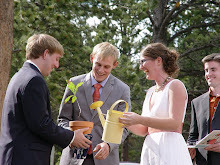 Lastly, including a charitable cause into your wedding is also a wonderful ice-breaker. The adoptable animals bios on each table got people talking about their own pets. 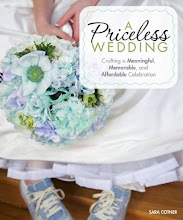 Above all, if you feel passionately about including a non-profit in your wedding, then you should definitely go for it. 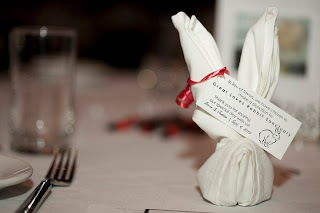 We had friends and family hesitate hat the idea of our veg-tastic, animal-centered wedding while we were planning it, but after it was all over, so many people commented on how perfect the wedding was for us. As a grand finale - here are a couple of pictures from our honeymoon. 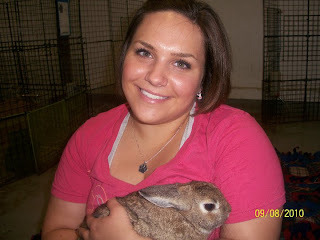 This is a photo of me holding one of my favorite bunnies at the sanctuary - Tito! 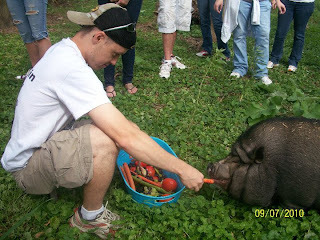 The photo of my husband shows him feeding one of the pot belly pigs who calls the sanctuary home. Please tell me this was at Bugg's Temple! They do a lot of doggie events there - Halloween costume contests and the like. They're very dog-friendly... I don't know how they COULDN'T be on the canal. The canal is dog-central! My last and favorite year of Butler I lived on the canal, just me and my rescue pup, far away from all our friends in broad ripple. We loved every minute of it - and walked the loop EVERY day. I LOVE THIS, and would LOVE to see a whole post about this wedding! Add me in as a second person who wants to know where you got married. I have a friend who wants her dog to be a part of the wedding, and I'd love to pass on your recommendation! Yes, we did get married at Buggs Temple. We got married in the 2nd floor restaurant called Euphoria. Our ceremony was on the balcony and the reception was inside. The pup was chauffeured back to our house right after the ceremony. We missed her so much on our honeymoon! 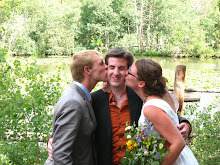 Wonderful wedding! How did your family react to the vegan menu? My guy and I are vegetarian as well, so I want to do a meatless mostly-vegan reception but he thinks guests may be upset there isn't the usual meat options. When it comes down to it, its our day and I don't want to serve food against our personal values and that we can't even eat ourselves!